Pork shoulder is located at the front leg and shoulder of a pig. Pork shoulder is a great meat to start out on if you are just getting into smoking meats. It offers an inexpensive option that is hard to overcook or leave in your smoker for too long. It also has a large fat content marbled throughout the meat that allows it to retain moisture during the smoking process. The reason why pork shoulder does not turn out fatty is because it will melt away while it is smoking and actually baste the meat with moisture. With a pork shoulder, you have to focus on the seasoning rub and the smoker wood chips rather than trying to keep this cut of pork from drying out. Combine all of your wet and dry seasoning ingredients together in a large bowl or dish with your pork shoulder and place in the refrigerator for 2 hours. Turn your pork shoulder after 1 hour to make sure the marinade ingredients coat all sides of your pork shoulder. Soak your wood chips in water an hour to two before you want to put your pork shoulder on the smoker. Soaking these wood chips will allow them to smolder and smoke for a long period of time instead of quickly burning up. Light your charcoal smoker approximately 30 to 35 minutes before you want to put your pork shoulder on. If you are using a gas or electric smoker, you can usually bring it up to temperature much quicker within about 10 to 15 minutes. Wrap your wood chips in an aluminum foil pouch and punch holes in the top with a fork in order to allow the smoke to escape the top of the pouch. Toss the pouch on top of the charcoal right before you put your pork shoulder recipe on the smoker. You may need to create another wood chip pouch after a couple hours because your wood chips will eventually burn away. Put your pork shoulder on the grates of your smoker and adjust the vent on top of your grill to about 3 quarters of the way open. Your grill vent should be positioned about 3/4 or all the way open to allow enough oxygen to keep your smoker hot. 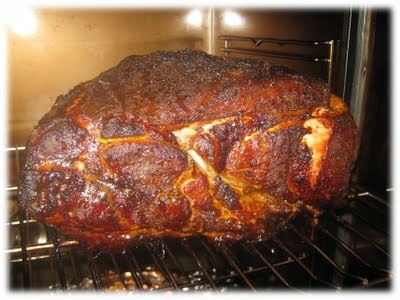 Check the pork shoulder every couple hours to add smoker wood chips and more charcoal to keep the temperature stable. You can also mop or spray (using a spray bottle) on any liquid seasoning such as Worcestershire or apple juice to add further moisture to your pork shoulder. Typical smoking time for pork shoulder is about 1 hour to 1 1/2 hours per pound, so an 8 pound pork shoulder may take about 10 hours to smoke. Pork shoulder takes approximately 1 to 1 1/2 per pound to smoke under normal smoking temperatures and conditions. Many factors can change the smoking time so it is best to monitor the internal temperature and look for 195 degrees Fahrenheit before you take it off the smoker. Remember not to over check your pork shoulder while you are smoking it because every time you lift the lid you are letting out heat and smoke flavor. We recommend purchasing a wireless digital meat thermometer in order to monitor the internal temperature from inside while you are smoking the pork shoulder.